Eldstar is one of the seven Star Spirits in Paper Mario. As indicated by his name, he is the elder of Star Haven and is inferred to be the leader and the oldest of the Star Spirits. He has a large white mustache, white eyebrows, and dark green eyes. Eldstar, along with the other Star Spirits, visits Mario after his loss to Bowser during the opening moments of Paper Mario. While Mario is unconscious, Eldstar comes to him in a dreamlike state and tells Mario that he must go to Shooting Star Summit. He then disappears, and when Mario asks the Toad about it, he tells Mario that he didn't see anyone go in or out. When Mario arrives at Shooting Star Summit, Eldstar is waiting for him. He and the other Star Spirits tell Mario that Bowser has captured them, and that they are only talking to him through a spiritual link that will soon be extinguished. He tells Mario and Goombario that to stop Bowser and save Princess Peach, Mario must first rescue the Star Spirits. Eldstar is guarded by the Koopa Bros. in Chapter 1: Storming Koopa Bros. Fortress and is the first Star Spirit rescued. When he is rescued, he grants Mario the powers of Refresh and Focus. Refresh causes Eldstar to replenish Mario's HP and FP by 5, and costs one Star Power. Focus causes Mario's Star energy to be boosted, and does not cost any Star Power. 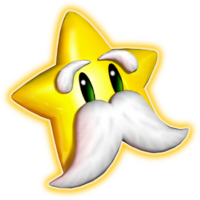 Eldstar later appears along with the rest of the Star Spirits in Star Haven when they give Mario the Star Beam. 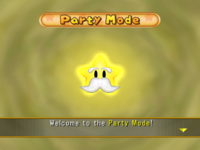 In Mario Party 5, Eldstar is the guide of Party Mode. Like in Paper Mario, he is the leader of the Star Spirits. In Super Smash Bros. Brawl, Eldstar is a Sticker that raises launch resistance by six. The sticker can be used by any character. Eldstar's Hint: When you see a "!" mark, explore. "Mario, my boy! When you see an "!" on the Field Screen, press "A" to investigate. You may find hidden switches or other things that will open closed roads. Hitting trees with your Hammer is also a fine idea. You may just knock down coins or other items that are stuck in branches." Make sure to search bushes, signs, and other places that catch your eye. Stand next to a tree, then use your Hammer. Chōru From 長老 (chōrō), elder. He is the only Star Spirit aside from Misstar that can be tattled on. He bears a resemblance to Millennium Star from Mario Party 3. This page was last edited on April 15, 2019, at 06:59.